In the time since I've also been lucky enough to use the Wotancraft Shadow Warrior backpack and I have to say I've grown accustomed to utilising this style of camera bag. I want to say I still have the original Commander but the truth is my eldest son has "borrowed" it in the way teenagers do.....that said it's still in the house and it's going to be really useful to have both versions to hand in order to fully appreciate the modifications and improvements. 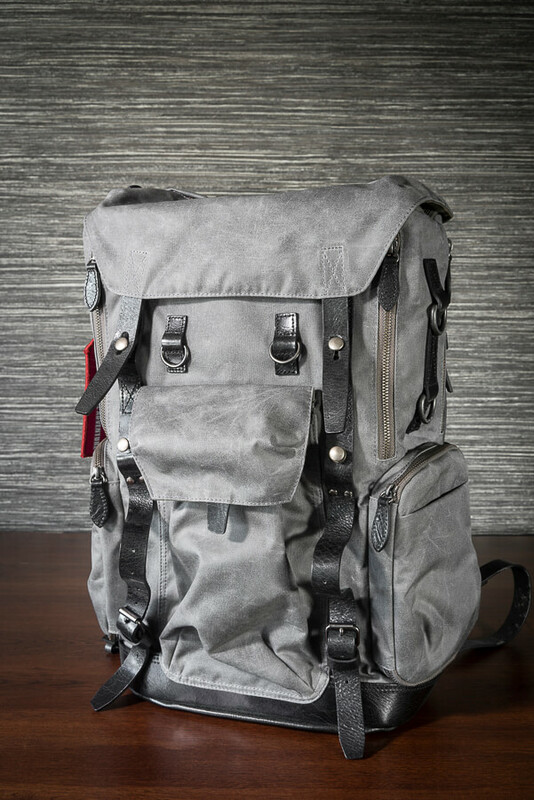 I've had the New Wotancraft Commander in Vintage Grey for several weeks but wanted to hold off with the review until I'd actually found time to hit the road with it. I didn't want to review the bag from behind a desk so in order to "field test" it thoroughly I'd take the bag with me through the Te Urewera National Park and on to the Mahia Peninsular here in New Zealand's North Island. Detachable Latex Foam Shoulder Pads. 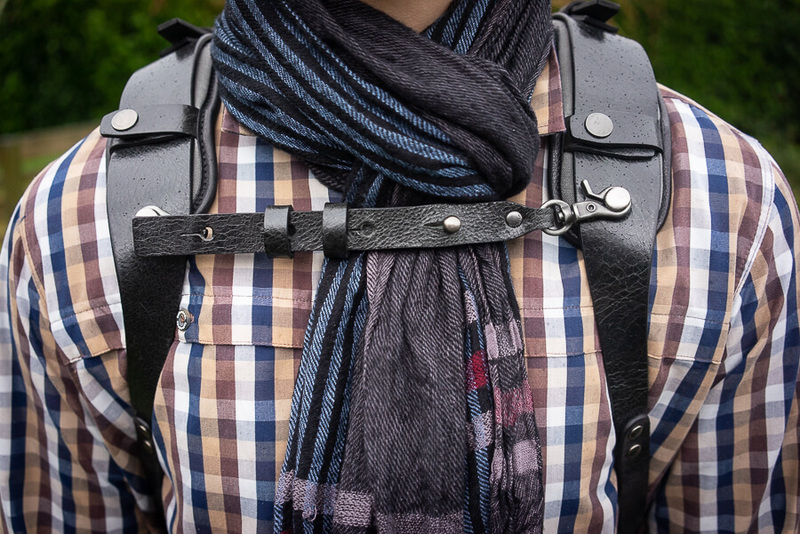 Detachable Leather Chest Strap Fastener. Built-in Aluminium Frame for improved structure. Interior Lining Upgraded to Velcro Compatible Medical Grade Microfibre. Removal of the Zippered Divider for Top/Bottom Segments. Added Velcro Secured Top/Bottom Divider. Side Zipper Openings are now Larger and Velcro Compatible. Compatible with "Module" Accessories for added Flexibility. The 2018 version of the Wotancraft Commander has undergone several significant improvements. These modifications have drastically improved both the usability and functionality of the backpack. At the same time, it's pleasing to see that Wotancraft has managed to retain that classic Commander look. On closer inspection, the first and most obvious modification is the increased overall size. The New Wotancraft Commander adds an approximate 10% increase in internal volume over its predecessor. I'm a huge fan of exterior fabrics used by Wotancraft, they have an ability to combine great design with robust materials to achieve a top quality result. The exterior the New Wotancraft Commander is as impressive as ever. Made from FOG CAMO Cordura © it's a Military Grade Cordura that is incredibly tough as well as being resilient to the elements. For those who are interested in a slightly more technical description of the material, it's essentially a 500 Denier Cordura © fabric that is made of heat resistant, ultra strength nylon yarn. It has a waxed treatment to the external face and the internal face has a water-repellent PU coating. The fabric is also printed with a very subtle fog like camouflage pattern. Over time the finish will mature with the addition of water-washed fading and scuff marks. Unlike a regular bag which may visually deteriorate over the course of time in my experience Wotancraft bags only improve with age. The New Wotancraft Commander is available in two colour versions. I have the Vintage Grey version with Black Cowhide. There is also an Ash Green version with Brown Cowhide - HERE. incorporating a lightweight Aluminium frame within the back the overall structure has been improved, there's no longer any "sag" and the bag holds shape particularly well. The adjustable chest strap is a simple yet highly effective addition. By making the bag more secure on the shoulders and chest the overall "carry" experience of the bag is improved significantly. Cowhide leather up-stand around the base of the backpack. 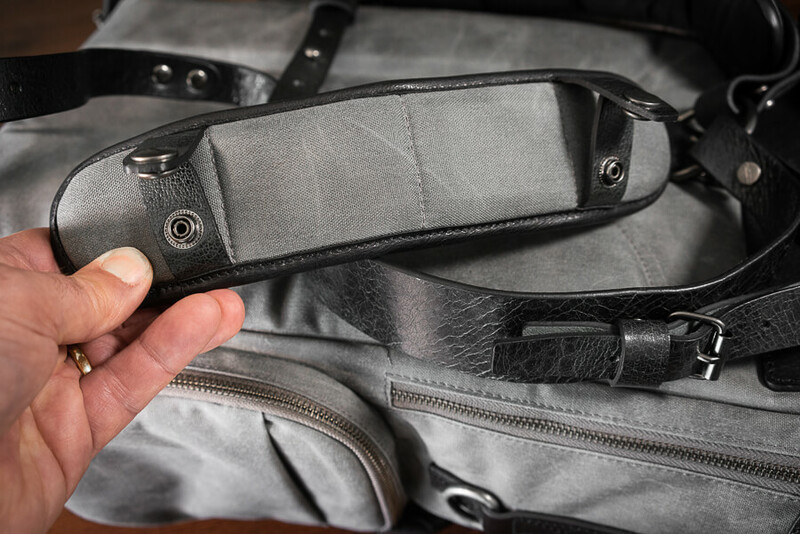 The size of the Side Zipper Openings has been increased to improve access to the lower bag. The New Wotancraft Commander utilises a distressed cowhide leather for its base. It's both very tough and great looking. When coupled with the internal padding it gives an excellent level of protection to what would otherwise be a vulnerable part of the backpack. I always find myself raving about the build quality of Wotancraft bags and of course this one is no different. These handmade bags really are the work of true artisans and each bag with its unique cowhide elements is essentially a one of a kind. I can still clearly recall my first experience unboxing a Wotancraft bag, the smell of the cowhide, the touch and feel of quality materials and of course a great visual aesthetic. If you come to Wotancraft from one of the mainstream bag manufacturers you really are in for a treat. 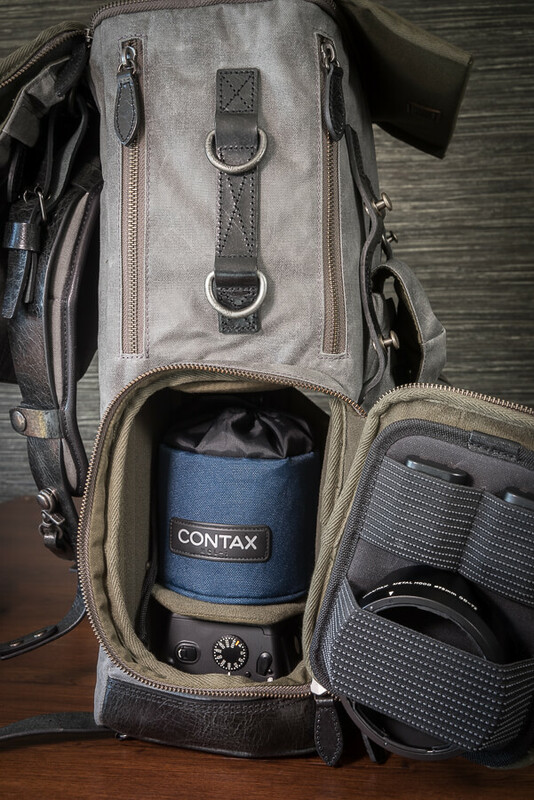 Utilise the Tripod strap holders on the rear of the bag. These strap hold my Manfrotto 190XPROB comfortably and it's not the lightest of tripods. Ultra-tenacity Bonded Nylon - Wotancraft use an adapted bonded nylon commonly used on leather boots and saddles. This 6,6 yarn has a coating that protects against chemical and elemental corrosion. Just one more step in ensuring your Wotancraft bag passes the test of time. The large zipper pocket in the top flap has been a consistent feature of the Commander and it's definitely my "go-to" pocket. I'll admit that often when I'm setting up a shot I'll lazily stuff things in it and then have to reorganise bits and pieces when I'm ready to move on. Beneath the Top Flap lies the Inner Lid with it's twin zippers, these allow the user to open the lid towards one particular side if they so wish. Additionally, with the Commander the user has always had the option to fold and hold all or part of the Inner Lid back by way of the magnetic retainers. A useful feature if you want to make access to gear a tiny bit quicker. 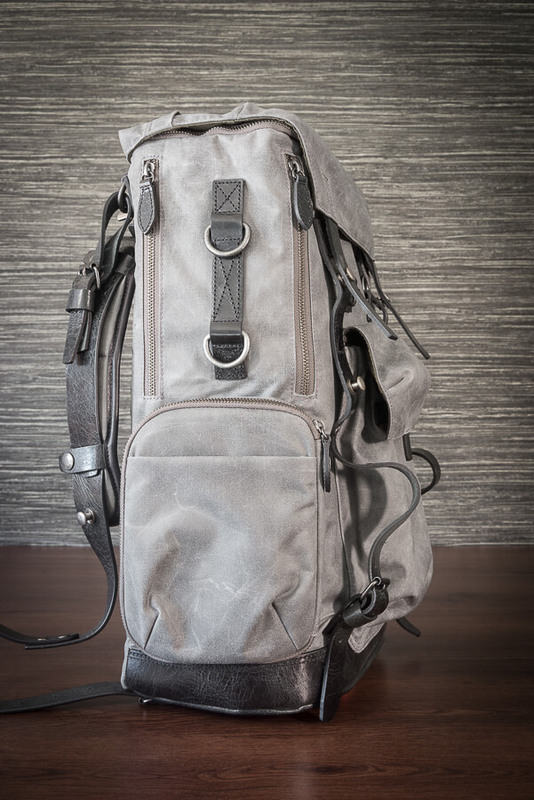 The backpack has numerous attachment points for accessories. With the addition of the new Medical Grade Microfiber Interior, compartmentalising the backpack and setting up bespoke configurations is now a breeze. Add to this the addition of "Modules" (separate section below) as well as the supplied dividers and the user has almost total control of the interior bag layout. 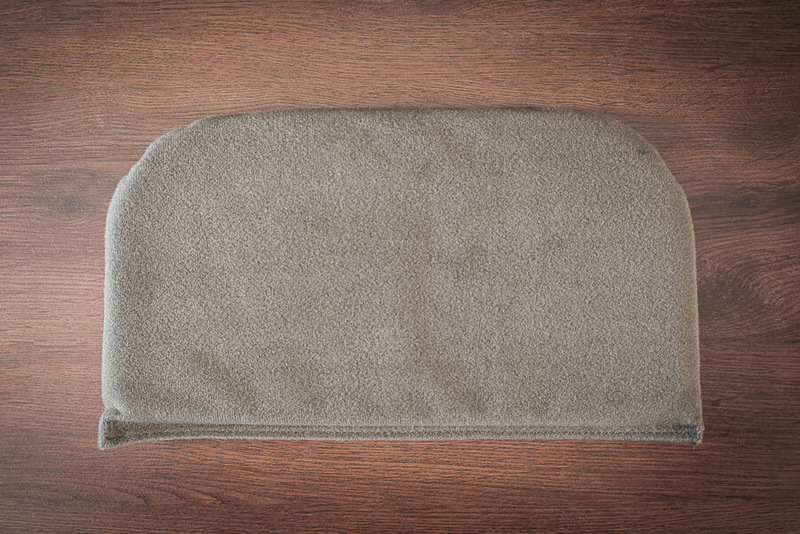 Above: The Inner Lid, unzips from both sides, you can reveal as little or as much as you like. Above: The new Commander ships with the Padded Quick Release Insert pictured above. The optional Waterproof Insert is also available for US$45 in the XS size - HERE. Or if you're lucky enough to have the right size insert from a previous purchase you can utilise that. The Quick draw insert is secured in place with velcro on both sides. The original cotton interior of the bag has now been replaced with Microfibre throughout. This is actually a significant improvement and makes the interior infinitely more flexible. As a result of this, it now means the dividers can be used anywhere in the bag. 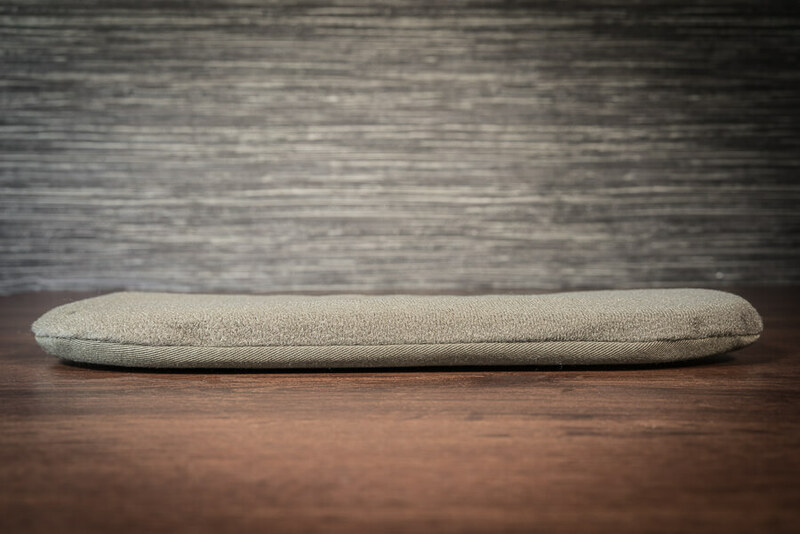 A feature of the Velcro compatible Medical Grade Microfibre is its improved longevity. The fabric can withstand multiple adhesions of the velcro accessories. Removing the padded Quick Draw Insert will reveal the Top/Bottom Section Divider. The Divider is secured in place with Velcro and when I say secured I really do mean secure. All the Velcro attaching elements of the bag including "Modules" attach with remarkable strength. The Velcro attachment method replaces a fixed zipper on the previous version of the Commander and once more the result is increased flexibility. The Top/Bottom Divider Insert can now be adjusted to a position of your choice. The bottom compartment as one space with "T" dividers removed. Above: The padded base of the New Wotancraft Commander, removable like everything else inside the bag. Above Right: The two part "T" Divider. I can't emphasise enough, just how much better the New Wotancraft Commander is with the improvements in functionality. There is one aspect of the New Wotancraft Commanders functionality that I am yet to fully explore and that is Single Shoulder Manoeuvring. The user can rotate the bag through 90' and utilise one shoulder strap while accessing the backpack through the Side Zipper Pockets etc. That I haven't used it so far is in part down to a combination of gear choice, how I shoot and what I shoot. I do intend to take a look at it though and I will discuss it when I update the New Wotancraft Commander Review in due course. My "14 Macbook Air, the compartment will comfortably hold 15" laptops and they'll be well protected. In the event you want to store something other than a laptop in the large rear pocket the internal dimensions are Aprox: H: 40cm W: 27.5cm, items with a thickness of around 15mm or under will fit with ease. The new and improved Shoulder Pads can be easily removed should you so wish but, to be honest they improve comfort and stability of the backpack so much, why would you!! EDIT: Whilst preparing the New Wotancraft Commander Review I received an email from Wotancraft advising that the Shoulder Pads have undergone a further upgrade since the release of the bag. Subsequently a new pair of Shoulder Pads would be despatched to me free of charge next week. It's exactly this level of service along with a commitment to improve their products that really elevates Wotancraft in my opinion. Detachable Latex Foam Cushion shoulder pads. Above: The front pocket has been increased in size to H: 26.5cm x W: 14.5 (approx). That represents an increase in the size of around a third. In addition, the inclusion of an elastic top and more fabric makes for a more versatile pocket. Above: Making use of the Card Holder Module and the Utility Fastener Module for an SSD. Securely fastening Press Stud coupled with the Elasticated top of the rear pocket afford some additional security although I'd always recommend storing your most valuable items elsewhere in the bag. Above: Utilising the Zipperless Pocket Module for my Revols Earphones and the Zipper Pocket Module for its associated accessories. With the introduction of "Modules," there has clearly been a concerted effort to build as much flexibility as possible into the New Commander, I think Wotancraft should be applauded for this. Having a high degree of flexibility when organising the accessories you carry is certainly a very welcome feature and ultimately one that lead me to purchase the bag. While the "Modules" are inexpensive, ranging in price from $10-$28 each they are extra to the bag and I do feel that some prospective customers may expect at least a couple of these to be included with the bag. I don't know the economics of the bag manufacture but I'll put it out there as "food for thought". Above Left: Cord Holder & Utility Fastener Module. Top Left: Zipper Pocket Module. Top Right: Zipperless Pocket Module. Bottom Left:2pcs Card Holder Module. Bottom Right: Lens Cap Holder/Utility Fastener Module. The "Modules" are held in place via the short hook velcro tab system and do fix very securely. They are constructed of the W.A.L Canvas (Cordura © 500D based) fabric. Where applicable a Braided Fibre Elastic band material is used. They are both lightweight & strong. I was able to find both conventional and unconventional uses for the "Modules" and the system worked well for me. Only the Zipperless Pocket Module caused me issue. It's quite a big pocket but the design of the overlapping top and a lack of any elasticity restricts access somewhat. On that basis, I found access to it a little restricted and too fiddly for my needs. 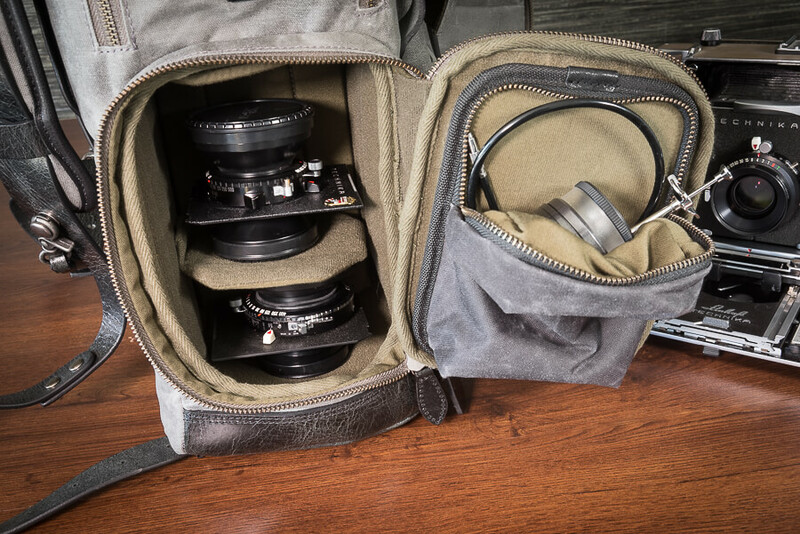 The Wotancraft Website has a handy photographic scale reference with several digital bodies and lenses adjacent to the backpack. The New Wotancraft Commander is capable of holding 1/2 Full Frame DSLR's with Battery Grip as well as up to 5 lenses (size dependent). My gear is a little less conventional these days so for my trip I decided to try the bag out with Medium and Large Format film gear. I'd be travelling with my Contax 645 set up and the Linhof Technika V.
I've photographed the gear I took with me on my "Field Test" below. In fairness, I'll most likely use the New Wotancraft Commander more often with a couple of 35mm Leica's, 2no lenses, 35/50 Summilux and my Rolleiflex 2.8GX. This all fit's tidily into the Quick Draw Insert and leaves me the entire lower compartment of the bag for other items. I like the idea of being able to pack a jacket, some lunch etc in the Commander and hit a trail for a day, self-sufficient. Above: The addition of the Medical Grade Microfibre to the rear of the Side Zipper Openings permits the use of "Modules". Select a "Module" that meets your specific requirements and essentially customise the bag to your exact needs. Above: Utilising the Cord Holder and Utility Fastener Module. Also the Small Divider horizontally. I found the backpack worked well with this Large Format Setup. Above: Unconventional use of the Cord Holder and Utility Fastener Module for 120 film!! The "T" Divider separating the 5x4 film holders and 6x7 Film Back. Above: Utilising the Small Divider (Horizontal) to separate 2no Large Format lenses. Utilising the Hidden Zipper Pocket Module for the focusing loupe and cable release. Usually, at this point, I'd post a selection of photographs from my trip. Unfortunately, the JOBO gods had other ideas. My machine is down at the moment, hopefully, it's just a faulty rectifier but I'm waiting on a friend to take a look. I've developed C41 by hand without the JOBO and whilst it's fine I do think the results are inferior and less consistent. One that basis I'm going to hold off developing. That said I have done one of the B&W 4x5's with a Patterson Tank so I at least have one image to show. To make the most of the JOBO breakdown situation I'm going to do an update to the review in the coming week. As I spend an extended period of time using the bag you invariable notice things. Black & White Image crop - Linhof Technika V - NIKKOR SW 75mm f/4.5 Lens. Exposure 1/4 Sec @ f/22. Ilford Delta 100 (Exp 5/15) in XTOL Stock (Mixed and refrigerated on 24/9/14......unbelievable) utilising the MOD54 and Patterson Tank. Whilst the New Commander may look similar to the original its actually so much better it may as well be an entirely different bag. It's fair to say that even I didn't fully appreciate the full extent of the improvements until I physically had the bag in my possession. It's bigger, but it actually feels smaller. It's heavier, but again it actually feels lighter. The reason for this is the improved design of the shoulder pads and chest strap. Internally, the introduction of "Modules" offers an extremely high level of flexibility. With some forethought, it should be possible to arrange the inside elements to suit your exact needs. I have a real appreciation for the way Wotancraft continually strive to improve the quality, functionality, and usability of their products. Good is never good enough, it must be exhausting but as photographers, we reap the benefits. I really can't recommend this bag highly enough. I hope you find this review useful, as always I'm happy to answer questions. Warranty: Wotancraft offers a 3-year Free Repair Warranty, given intended use with shipping fee paid by the sender. Local Taxes: Painful I know but please check as the buyer is responsible. For full details on all of the above please refer to the official Wotancraft Website.